I was looking for a way to use some leftover pomegranate arils, and took inspiration from a recipe (“Roasted Cauliflower and Hazelnut Salad”) in the Jerusalem cookbook. I left out a number of ingredients and added some of my own, so that’s why I say that I was simply inspired by the original. In any case, it turned out really well, and I’ll make it this way again. 1. Toss the cauliflower florets with the olive oil, about a teaspoon of kosher salt and a few grinds of pepper. Spread out on a sheet pan and roast in a pre-heated 425 oven for approximately a half hour, or until the cauliflower starts to brown. Toss it around a couple of times during roasting. Set aside to cool. 2. Toast the walnuts in a dry pan on the stove. Shake the pan to prevent burning. This should take about 5 to 8 minutes. Let the nuts cool as well. 3. Slice the celery at an angle and separate the leaves. 4. Combine the cauliflower, nuts, pomegranate seeds, celery, sherry vinegar, and maple syrup in a bowl. Toss well. 5. Check for seasoning. You might want to add some salt. Serve at room temperature. Note: The leaves from the top of celery stalks are a really good substitute for those of us who dislike cilantro. 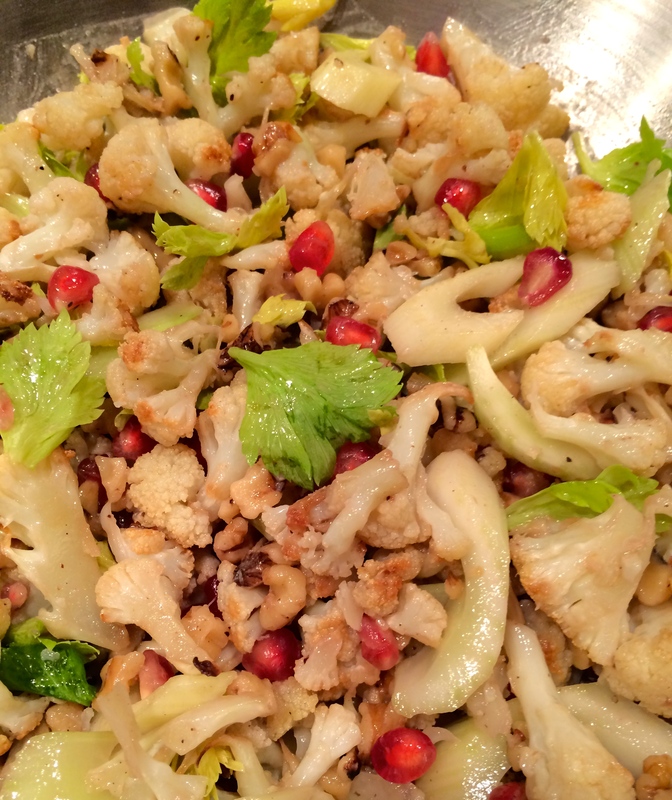 This entry was posted in recipe and tagged pomegranate arils, Roasted Cauliflower. Bookmark the permalink.